How Did I Live Before Today? Waking up this morning to find that I was out of coffee creamer was a hard hit to my system. But, as the selfless mom that I am, I kindly allowed my daughter to finish her breakfast before scooping her up and heading to the grocery store in search of this necessary coffee accoutrement. Yes, friends, in my world coffee creamer IS necessary. I don't care what you say. Milk is too bland. Half-n-Half doesn't cut it. And let's just be honest: black coffee is disgusting. Don't deny it. My husband, who likes his coffee to be roughly the shade of mud, is disgusted by the amount of creamer I put into my morning cuppa joe. His words, "Do want more coffee with that creamer?" Hubby says that I add the coffee to my beloved creamer, and not the other way around. I say he's getting stuck on semantics. My go-to creamer is Coffee-Mate. I've taste-tested every brand out there. 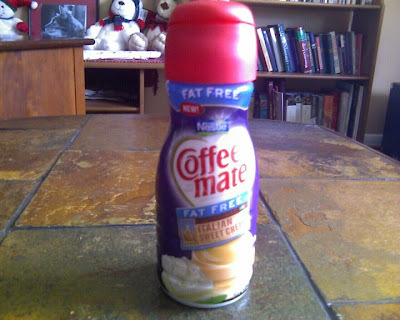 And Coffee-Mate is far superior to every other coffee creamer there is. It's just a fact. While they are all scrumptious additions to java, I try my best to stick to the Fat Free varieties as a favor to my figure. Not that creamer, in general, is a favor to my figure. But I digress. Hazelnut was the flavor of choice for most of my life. I could deal with French Vanilla, but Hazelnut gave that nuttiness my palate craved. Then one day, Coffee-Mate came out with their "World Cafe" selection. And my life would never be the same. 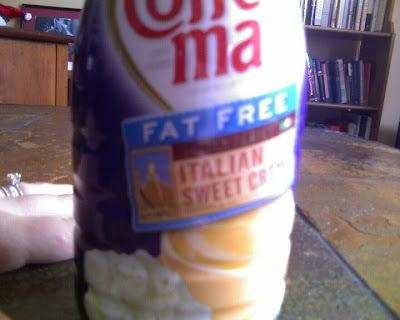 Because that day, my friends, I was introduced to the most beautiful creamer known to man: Italian Sweet Creme. Oh the perfection of this creation. Slightly sweet, but not over-powering. Just a hint of flavor. The taste is akin to sweetened milk. But better. The only problem? It's not Fat Free. Once in a while, I would indulge. I would allow myself to purchase the specialty creamer, and enjoy every last drop. It was especially tempting when they started to manufacture Italian Sweet Creme in the larger bottle (bestill, my heart!). But, over time, my conscious always got the better of me, and I would pass over the Sweet Creme bottle for the regular boring stand-by Hazelnut (no offense, Hazelnut). So this morning, in a lack-of-caffeine haze, as I am trying to wrangle a 19-month old in the grocery store, I make my way over to the creamer section. And what should I find sitting precariously upon the shelf? What? Do my eyes deceive me? Yes, friends. It is true. And the proof is in my refrigerator. Coffee-Mate: Why are you so good to me? And PS - does anyone want to buy me a new camera? My images are, in all honesty, an embarrassment to technology. (Disclaimer: Coffee-Mate did not pay me to say such nice things about their products. They did not ask me to endorse their heavenly creamer. I'm pretty sure Coffee-Mate does not know who I am. Today, I am just speaking from the heart). 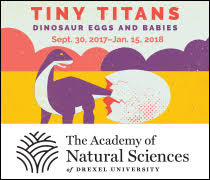 Nooo, no, no. Iiinternational Deeelights eees ze better creeamer for ze coofee. I used to say this before I was married: "I like my coffee like I like my men. Tall, dark and handsome. HOT, rich and strong. And then I would mutter under my breath, "but everynow and then I'll take a little cream and sugar". Meaning I liked blond haired, blue eyed guys... which is what I've been so blessed with. Guess what?!?!? He drinks his coffee black, too. We were destiny.